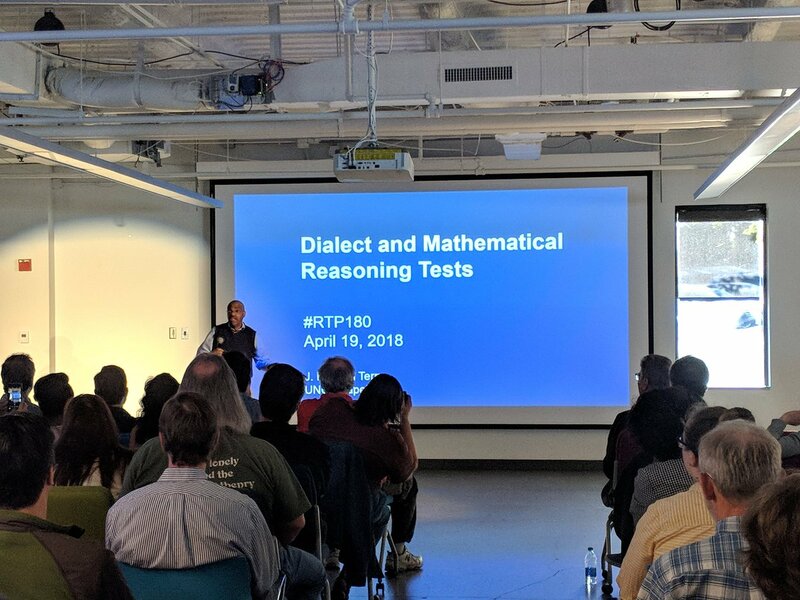 At its surface, language may not sound like the most scientific topic, but on April 19, our five speakers proved that studying how we learn and use language can provide a deeper understanding of our cognitive processes, social interactions, memory, and more. 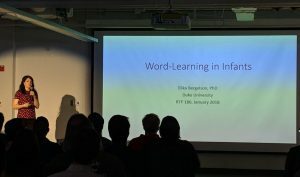 In her research at Duke, Dr. Bergelson and her team work to understand early language development. She focuses on the relationship between learning a word and using it in speech or understanding it when spoken. Using eye tracking technology, they have been able to measure early word comprehension and demonstrate that infants as early as six months old can understand and identify nouns. 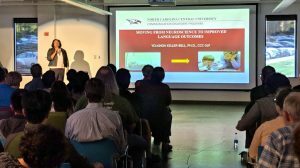 Watch Dr. Bergelson’s talk here. An expert in German, Dr. Smith explained that learning a foreign language has been proven to help combat memory loss. He also discussed the concept of “bildung,” a German word that, when applied to learning, means something that shapes and transforms your education. According to Dr. Smith, words like bildung are proof that concrete words can represent abstract concepts and ways of thinking. 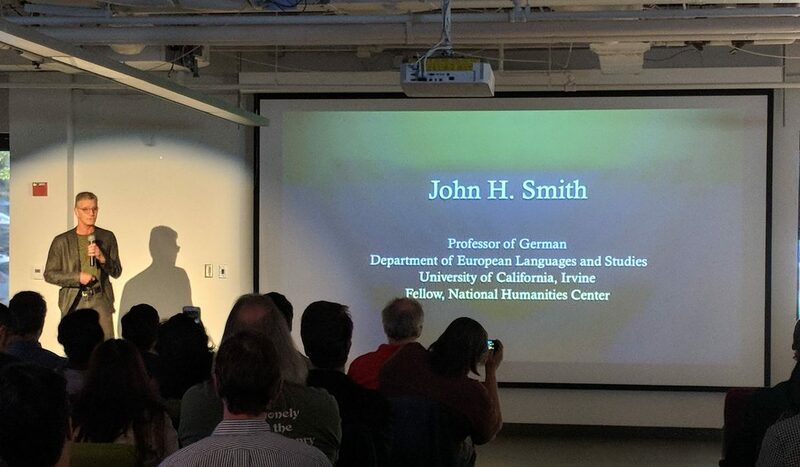 And, while he is fascinated by AI technology when it comes to language interpreting, Dr. Smith believes there is still a human element to dialogue that machines will never be able to replicate. Watch Dr. Smith’s talk here. Linguist J. Mike Terry focused his time on the effects of dialect on mathematical reasoning in children. 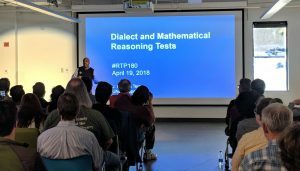 He explained that speaking a different dialect of English has been proven to have an effect on educational outcomes, and his work seeks to learn the reasons behind that. By understanding that language has both a practical purpose and social nature, Mike says, we can work to better understand educational disparities among children who grow up in different geophysical locations and socioeconomic situations. 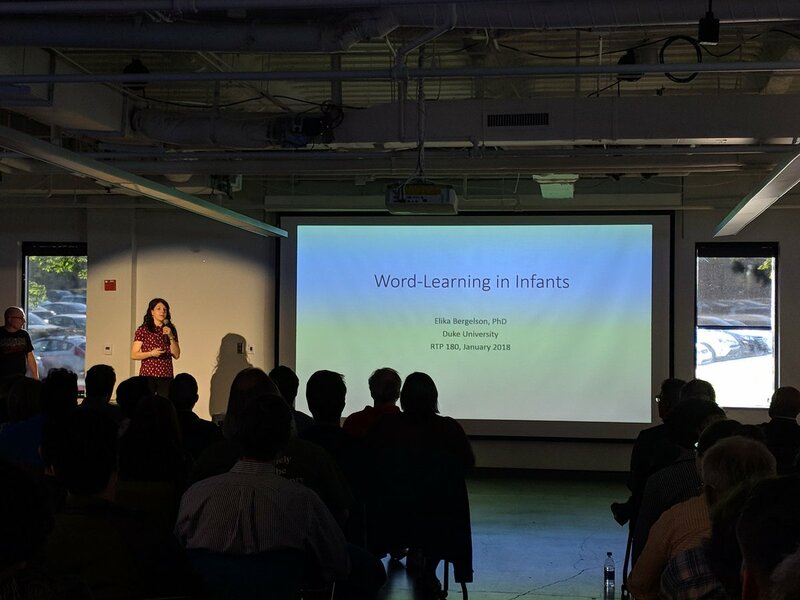 Dr. Keller-Bell took the stage to discuss the connection between neural activity and language in early childhood development. She provided animal examples, including birds and guinea pigs, to illustrate the nuances of communication and how small changes can have large effects. Today, she says, early intervention for neurological disorders in children begins at age 2 or 3–her goal is to determine whether we can intervene earlier for a better impact and improve quality of life for those children. Watch Dr. Keller-Bell’s talk here. Dr. Heit found a way to combine his love of language and his interest in technology: by creating a computer algorithm that helps teachers grade papers and helps students write better. 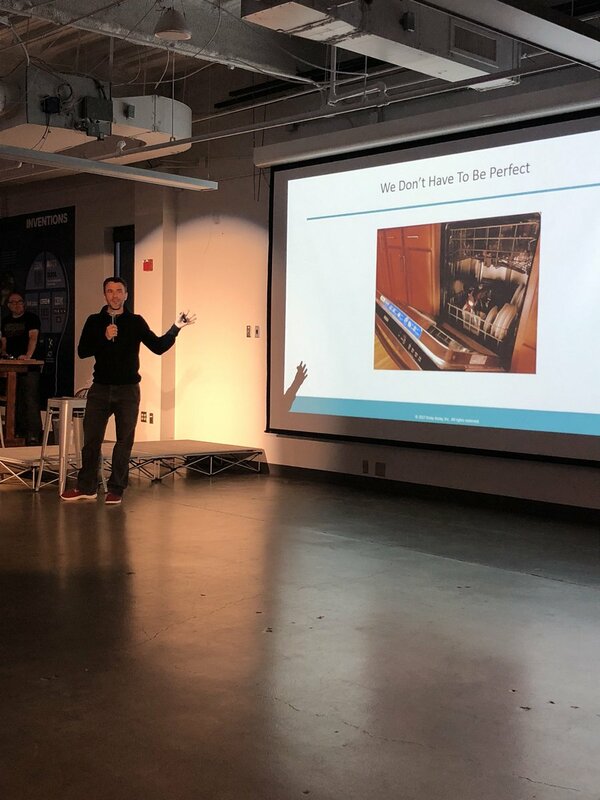 His company, ecree, has a goal of improving those relationships between students and teachers through a more efficient learning and grading process, saving time and empowering students to improve their writing skills. Watch Dr. Heit’s talk here. 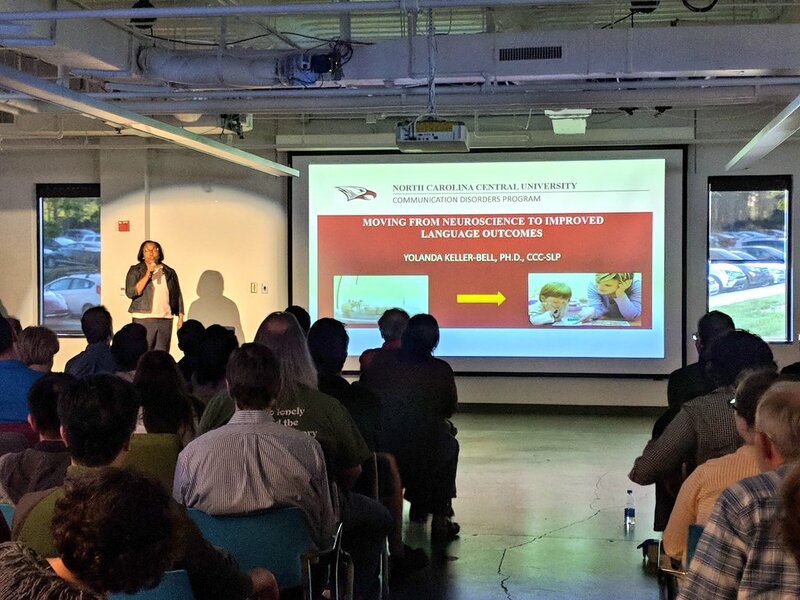 Get your tickets now for RTP180: Startup Research May 17. 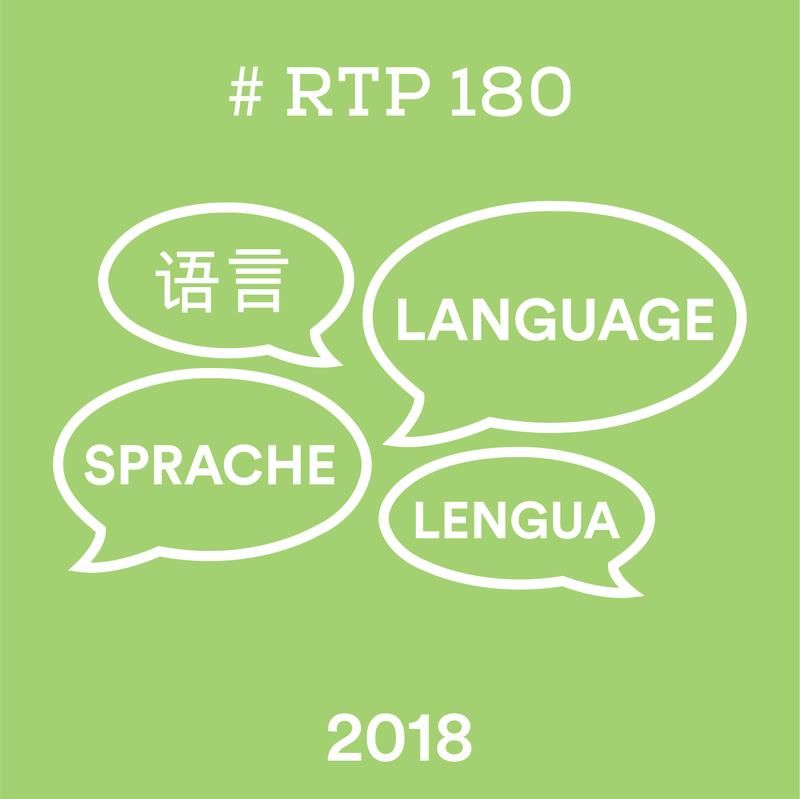 This RTP180 will be a nod to Triangle companies who are doing startup research. 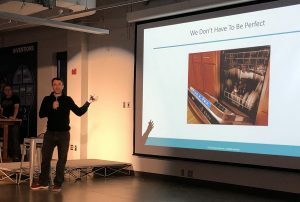 We are talking unprecedented, bootstrapped research that was done with a startup mentality—perhaps an operation that started small, gained momentum, and scaled. The next big thing in research may be happening right here in our backyard!